How to craft a U.S. response to China’s recent actions in the maritime domain — particularly the South China Sea. China’s assertive rise is creating growing turbulence in maritime Asia. Despite a slowdown in China’s economic growth, Beijing is investing heavily in military and paramilitary capabilities designed to project greater influence over the East and South China Seas and beyond. More importantly, Chinese leaders are increasingly willing to risk short-term reputational costs to maximize long-term gains with respect to sovereignty claims. China’s assertive behavior is manifested in myriad ways. It exploits ambiguous and weak legal and diplomatic frameworks, from the United Nations Convention on the Law of the Sea (UNCLOS) to institutions centered on the Association of Southeast Asian Nations (ASEAN). It conceals hard power behind the seemingly more benign image of white-hulled coast guard and law-enforcement forces, even though it often uses those forces as weapons, equips many of them with arms, and is deploying them in both greater number and tonnage than any other nation in the region. It mixes the carrots of trade and finance with the sticks of information warfare and mounting military deployments and operations. Discerning the precise aims of Chinese behavior is difficult. There is ample reason for caution, however. Those who see in China’s assertiveness a well-thought-out and long-term grand strategy should temper that assessment with a balanced look at China’s enormous internal challenges and self-evident cooperation in selective spheres of international relations, including trade and climate change. At the same time, those who put their trust in rhetorical blandishments, whether issued by the Foreign Ministry or President Xi Jinping himself, should be sobered by China’s more contradictory and less cooperative actions. Despite Xi’s vow not to militarize the South China Sea, China’s behavior is a better forecaster of the future than reassuring words. For example, having built three new runways on artificial islands in the South China Sea in the past two years, China’s deployment of surface-to-air missiles (SAMs) and fighter jets on Woody Island and the apparent erection of a high-frequency radar installation on Cuarteron Reef seem obvious harbingers of what is to follow. Individual actions by China can be viewed as discrete challenges to neighboring states. But they are part of a larger pattern of challenging a post-World War II regional order built by major stakeholders, including the United States, Japan, and many others. By developing the military wherewithal in the form of anti-access and area-denial (or A2/AD) capabilities, China seeks to erode America’s preponderant military position that undergirds the regional order. Change and adaption are necessary, of course, but they should not come at the expense of accepted rules and norms of behavior. That is why even more disturbing than China’s military buildup is Beijing’s assault on the rule of law and the principle of settling disputes peacefully. China’s unwillingness to join the Philippines in seeking international arbitration as an ideal means of clarifying fundamental points of law under UNCLOS, coupled with Beijing’s foot-dragging with regard to a binding Code of Conduct, are bad omens for the entire region. Other claimant states should not be ignored because of their small size, and no one country should be allowed to decide that the world’s maritime powers should be excluded from protecting some of the world’s most important international waterways. In sum, we cannot know the future destiny of China, nor the final aims of Chinese leaders bent on achieving the “China Dream.” But whatever the exact goals of Beijing, the consequences of continuing down the current path should be clear: a looming China that carves out an ever-larger sphere of influence so that it can determine who uses the maritime and air commons of the Asia-Pacific region. Whether you consider China’s growing internal suppression of political rights and free speech, or its use of tailored coercion in the East and South China Seas, relying on the benevolence of future Chinese leaders is a high-risk strategy. Hence, the policy imperative is to find a way to safeguard national interests and regional order in the face of China’s expanding challenge to both. The U.S. government’s policy response to a more able and willing China continues to evolve along with China itself. Yet much of the official U.S. approach is derivative of the Obama administration’s policy of comprehensively rebalancing to the Asia-Pacific region—a policy that encompasses economic, diplomatic, and security instruments of power. Critics of the so-called pivot to Asia fault it on a number of grounds. One such complaint is that in shifting priority focus to Asia the United States has neglected new security threats to Europe and the Middle East. While some of that concern has been corrected, moves to increase military engagement in places like Syria, Iraq, and Libya, and the dispatching of two military brigades to Europe, only exacerbate a second area of concern regarding the rebalance policy: namely, its inconsistency and incomplete follow-through. Finally, some critics grant that the administration is minding U.S. interests and influence in the Asia-Pacific region, but they still lament the lack of results and the relative ineffectiveness with respect to dissuading China’s cabbage and salami-slicing tactics in maritime Asia. Clearly the United States needs a strategy, not merely a collection of reactive policies. That strategy in turn needs a long-term focal point to keep it on course, and to reassure allies and friends about America’s determination to remain a vital and permanent Pacific power. To be compelling, however, the United States must found its strategy on comprehensive power and unstinting engagement. Finally, Washington policymakers must be equally adept at imposing costs on bad behavior while daily investing in forging a successful regional architecture. Above all else, the United States seeks to work with all nations on creating a region that is inclusive, open to free trade, and rooted in the rule of law. Trade, business, and development are foundational for anchoring long-term interests in the Asia-Pacific region. Amid a U.S. election year demonstrating flashes of isolationism from the left and the right, nothing seems guaranteed with respect to American staying power. Yet I remain confident that the next president will wish to build on President Barack Obama’s rebalance policy, not least on the signature trade and economic initiatives such as the Trans-Pacific Partnership or TPP. However, the next administration will need to connect the initial TPP accord with other trade, investment, business, and development ties throughout the region, not to mention making a successful case for why expanding economic engagement with some of the world’s most dynamic economies remains in the interest of ordinary American citizens. American diplomatic activity also cannot afford to flag. The United States’ foreign policy must seek to support effective action against assaults on regional norms and rules. Whatever the shortcoming of Obama’s rebalance policy, his administration has been diligent at showing up and diversifying U.S. regional engagement. The leaders’ summit at Sunnylands in mid-February underscores this heightened level of diplomatic engagement, which arguably began with the administration’s July 2009 accession to the Treaty of Amity and Cooperation–and with it the joining of the annual East Asia Summit process. Obama’s successor will be wise to maintain this level of active regional engagement, even as he or she seeks to improve upon delivering meaningful results from America’s growing diplomatic investments. Engaging China is essential for the United States, but that engagement should be calibrated based on the willingness of Beijing to negotiate effective and fair accords. When looking for diplomatic impact, the region needs to move beyond communiqués that emerge from large gatherings to more agile and focused responses to bad behavior. For instance, even while ASEAN searches for a Code of Conduct with China, a coalition of willing states throughout the region should voluntarily announce steadfast support for an agreed and binding CoC. Similarly, following the likely ruling that will be handed down from The Hague around the end of May, governments should be prepared to quickly rally around the ruling as a preferred means of settling disputes amicably and fairly for all. 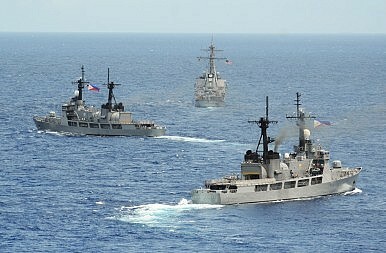 Arbitration is one of the vehicles for peacefully setting disputes under UNCLOS. But such legal means require further action if misdeeds and unlawful actions and claims are to be countered successfully. For instance, it will be important for leaders to support the hard work of the five professional arbitrators who are carefully pouring over vast amounts of information presented by the government of the Philippines. If the arbitrators determine there is no legal evidence under UNCLOS to support an historic rights claim to the implied limits of China’s so-called nine-dash line, then surely that judgment deserves to become the new basis for moving forward as a region. Meanwhile, bad behavior such as the militarization of islands in the South China Sea should incur costs. One might imagine aggressive actions by China being met with international cooperation to prevent the flow of certain advanced technologies, such as those associated with quantum computing, to China. But beyond legal remedies and the possibility of targeted sanctions, the best response remains building up a regional system based on the interests and values of like-minded countries opposed to unilateral changes to the status quo through coercion and force. Put differently, these economic and diplomatic pillars are necessary, if insufficient, means of bolstering regional order. The United States also needs to invest adequately in its own defenses and in security cooperation. Washington must not allow the desire for strategic partnership and cooperation with large neighboring states to interfere with a clear-eyed and persistent focus on building of defense capacity. All countries deserve to have a minimal level of self-defense capacity, and large countries such as the United States, Japan, South Korea, Australia, India, and others can and should be keen to offer assistance. Maintaining presence means investing in sufficient numbers and capabilities and keeping them forward deployed and regularly conducting operations, including flying and sailing where international law permits. It means also investing in so-called “third offset” strategies, largely based on harnessing emerging technologies and adopting new concepts of operations, to preserve power projection capabilities in the face of growing A2/AD threats. An effective security posture also requires the further strengthening of America’s alliances. The 2015 U.S.-Japan defense guidelines put that alliance on a course to achieve greater operational integration, including cooperation in the domains of cyber space and outer space. Likewise, the U.S.-Australian alliance has never been stronger, and sending Marines and Air Forces for regular rotational training in Australia might provide a model, albeit on a smaller scale, for the U.S.-Philippine alliance to emulate—especially now that the Supreme Court has ruled on the constitutionality of the Enhanced Defense Cooperation Agreement. Building partnership capacity is vital for most countries in the region, including the Philippines, Vietnam, Malaysia, Indonesia, and others. Vietnam’s strategic relationship is invaluable to the United States, and Washington welcomes Vietnam’s contributions to maintaining regional peace and stability (for instance, including Hanoi’s support for U.S. freedom of navigation operations recently off Triton Island, the same island near where China has deployed a deep-sea oil platform). If SAMs in the Paracels and radars in the Spratlys are intended to be a response to measures to uphold international law, then surely they will only create the kind of regional security environment that Beijing professes to fear. Finally, a stronger security posture can be achieved by greater region-wide maritime cooperation. Some of this might take the form of strengthening an Asian power web, a network of intra-Asian security and defense exercise, training, exchanges, joint operations, and technology cooperation and procurement. For example, we should be building on Singapore’s successful and inclusive Information Fusion Center concept in order to help create greater transparency and a shared or common operating picture. All countries can benefit from real-time information and better maritime domain awareness, whether for improving responses to humanitarian disasters or upholding the rule of law. Through all of these cooperative and cost-imposing steps, the United States can pursue the incremental strengthening of an inclusive, rules-based system while building capability that can help deter and dissuade adventurism and rule-breaking, even in the gray zones of maritime Asia. Dr. Patrick M. Cronin is Senior Advisor and Senior Director of the Asia-Pacific Security Program at the Center for a New American Security (CNAS) in Washington, D.C. This essay was prepared for the Symposium on Maritime Security Cooperation for the East and South China Seas, conducted on February 26, 2016 at De La Salle University, Manila in the Philippines. It's finally clear that the United States is not willing to confront China in the disputed waters. A Recipe for Disaster in the South China SeaDownplaying Sino-US Tensions in the South China SeaPresident Trump: The View From ChinaUS Must Hold Firm in South China Sea DisputeThe South China Sea: Freedom of Overflight or ‘Unlawful Activities’?